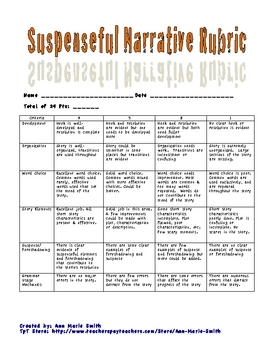 4 Point Rubric for Writing a Suspense Narrative Essay focusing on these writing componenets: Development, Word Choice, Story Elements, Suspense and Foreshadowing, Grammar/Usage/Mechanics, Organization; Writing a Suspense story is perfect for around Halloween. You may also want the power point prouduct that rubric fits! Happy Haunting with your students!